Editor’s Note: The author shows that the wood of living trees may be dyed without damaging them (chemistry). In long-term experiments, initially with trees his team had planted itself (botany), it was possible under suitable conditions to obtain wood thoroughly dyed or impregnated with the compounds tested (some from Table 1) after the trees had been felled. Planting the trees gave them the idea to try and use living trees as building material (architecture): tree constructions. Again, they got positive results, albeit only in Brazil from the long-term experiments started in 1966. With the aid of the yeast cell preparation developed by the author in a completely different context in 1948: H 2000 (chemistry,) it was possible to enhance the growth of trees indirectly (through soil micro-organisms) which had previously been tested on many useful and ornamental plants. Topic 2) Dyeing the wood of living trees (1942, start 1955). In lab test experiments the cytorrhysates obtained from plant cells, for example yeast cells, under "mild conditions" at the time increased the growth of micro-organisms including soil bacteria. Systematic plant experiments with such preparations showed an indirect growth-enhancing effect, i.e. our yeast cell preparations promote the growth of micro-organisms in the soil and thus, secondarily, plant growth. That this was no direct growth enhancement was shown in experiments carried out expertly at our request in a BASF experimental station. As plant soil, one part of fine sand and one part of peat was used. Planting was carried out on May 20 and May 25, respectively. The photographs were taken on July 1. The test solutions were added to the watering can in an amount of 1 part per 1000. 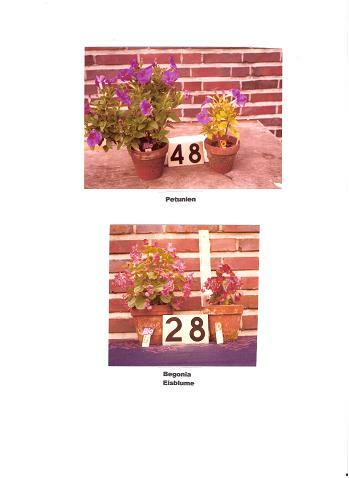 The following 12 photographs show a comparison of plants treated with yeast cell preparations (on the left-hand side) and control plants (right-hand side). Nos. 43, 39, 37 were grown from seed, all others from seedlings. The positive results achieved with trees such as planes, willows and others have found their way into patent specifications, just as the ones described here. 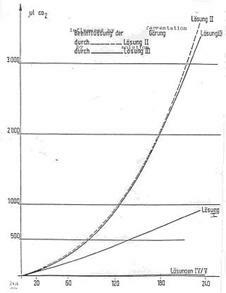 The growth effect described is based on an activated cell metabolism which may, for example, be proven by WARBURG experiments with increased CO2 production or increased O2 consumption. Measurements and growth experiments with fish and tadpoles are described in the SPECIAL PART: Diagram 1 and Tables 2 and 3; details regarding additional characteristics of the new yeast cell preparations called H 2000 are also to be found there. The author wishes to thank Mr. Tan Hing Kong, a photographer by training, K. Nolde and H.-J. Hein, certified chemists (Diplomchemiker), for their valuable assistance in the experiments on Topic 1) which were carried out in Berlin. The same applies for planting trees in connection with Topic 2), and the planting of trees in accordance with certain construction plans (Topic 3). Flower experiments regarding „redyeing“ are described in the APPENDIX (10). Topic 1) Plant Technology experiments were also started and executed on the Azores where the author’s friend, the actor Christian Rohde stayed many months in every year (Peniche Matosinhos) 1975-86. What counts here is testing whether and to what extent living trees may be used as construction material, especially in combination with "non-living" materials. Since Topic 3) was derived from 2), there is partial overlapping. To realise this project, young trees had to be available in an untouched area, suitable components in solutions had to be found; and an injection method had to be developed which did no harm to growing trees. For more details about our "detours" regarding Topics 2) and 3), refer to Section SPECIAL PART. Thanks to an engineer with whom the author was acquainted, Dr. Brandmayer (Plate 3) we had the possibility to work on Sprengplatz in the Grunewald in Berlin (WEST) from 1954 and to carry out experiments which would not have been possible in a regular lab, e.g. permeation studies on plastic foils with warfare agents such as Lost and nerve gases. This was done in cooperation with the expert on warfare agents, Dr. Otto Schmidt, called Uncle Otto in chemical circles [PROJ XVIII in (3)]. Also, refer to additional remarks on the topic "shack" in SPECIAL PART. The trees growing around Sprengplatz gave us hope that our long-planned dyeing and stabilising experiments on trees of different kinds would be possible. Unfortunately, however, the Forestry Commission of Berlin learnt about our project after only three years, in Dec 1957, and put a ban on them. "Don't touch any trees!" Therefore, the author had to look for other routes to carry out his planned dyeing experiments. That same year, he got an opportunity to plant his own trees. In connection with his appointment to the chair of Biochemistry, a building in Berlin-Lichterfelde-Süd had been promised to him which also included spacious grounds with a hothouse and outbuildings. There we were able to plant trees for further experiments. Since we had to plant the trees ourselves anyway, why not use living trees as building materials? What started as a provisional solution as a result of the official ban, gave us the idea for Topic 3). Preliminary experiments for Topic 2) were continued with the assistance of Mr. Tan Hing Kong, landscape gardener and photographer, and with H.-J. Hein, K. Nolde, certified chemists, and the experiments for Topic 3) started. The preliminary experiments for Topic 2) which started at Sprengplatz between 1955 and 1958 and were then continued in Lichterfelde from 1962 onwards concerned the development of methods for injecting aqueous dye and metal salt solutions into the tree trunks. This work required cuffs with good sealing properties so that the compounds used as "dye solutions" could be applied under water. We carried out tests in which height of the stem the cuffs should be best placed. Our test range was between 25 and 150cm. We found out: the lower the better. Specifically, the first experiments with selected compounds (Table 1) had the purpose of developing test methods, i.e. to identify suitable concentrations and to determine application sites and the number and interval of injections. * The cited dyes were exclusively those permitted for use in food. Some of the dyes cited here were already tested in Berlin, and four turned out to be unsuitable. Using the injection method we developed there, it was possible to start long-term experiments in Brazil in 1966, using 20 to 40 trees for each of the above-mentioned compounds and for every additional experiment. The tests included: commencement of dyeing, observation of the dyeing process depending on time, pH, light and additional applications of the dye and salt or complex salt solutions, analysis of ground. In order to monitor the progress of dyeing, we felled trees from time to time. In order to identify damages, we took photographs over the years in accordance with the season so as to be able to make comparisons with the previous year. Every tree included in the test was registered individually. The trees we treated were to supply wood for normal construction work which was dyed through and through and impregnated. At the time, we found no references to such experiments in literature; numerous discussions with gardeners, landscape architects and owners of plant nurseries on the topic "tree dyeing" did not lead to anything. The same applies for Topic 3). K. Nolde thoroughly and systematically searched the publications in chemistry and botany regarding Topic 2) and 3) from 1960-82. Later H.J.Hein took over. As mentioned above, we were able to carry out parallel large-scale main experiments (i.e. with 20 to 40 trees for each experiment) at UFSM in Brazil based on the results of the Berlin preliminary experiments. Most of the registered trees were observed over 10 to 15 years and then felled. Some trees were felled in between to check the progress of the staining and to look for possible undesirable side effects. After we had pooled the experience from the first 10 years, many different tree species were included in our investigations. As a precautionary measure, we also started protected forest plantations of suitable trees in Brasil in the years 1964 (Facenda) and 1972 (Ruraima) so as to be able to use homogeneous tree materials which had not grown wild; in particular, we had tree material for Topic 3) in mind, e.g. planes, willows, and others. From time to time, the author summarized his results on Topic 2) in lectures. At the request of the industrial enterprises involved in the project, he refrained from publishing: "As my reports on the details of the test conditions selected and found practicable (such as: types of trees, types of solutions, concentration of solutions, number of applications, dependence on season, site of application, time to start injections, intervals etc.) are all still secret, I regret that I am unable to provide any further details here". In order to attract the interest of students and collaborators for the plant technology experiments on Topic 2), the author made use of the Brazilian mentality at Easter 1966: The religious feast of Easter plays an important role in Brazil and is an occasion for giving gifts. Easter eggs are painted, as are the faces of the BICHOS, the rookies at UFSM. Here, the author saw an opportunity for motivation. Together with Prof. Joachimovicz, pharmacologist of UFSM, he started an experiment to inject food dye solutions into chicken eggs before they hatched to get chicks in very colour desired. After some experimenting, our efforts were crowned with success (6); see Fig 3. It is well known that trees grow all their lives both upward at the top (young shoots) and also in circumference (annual rings), albeit more slowly in advanced age. Trees react to mechanical stress by incorporating lignified tissue into the trunks and branches; moreover, they form strong reinforcing elements as a result of stress. At contact sites, pressure tissue is found which is visible in thick bulges resistant to pressure. As a result of gravitation, lignification in the lower portions of trunks, branches and twigs is more pronounced than in the upper portions. Wood gives trees stability and makes possible the transport of the essential water and nutrients from the root all the way to the leaves through an intricate "pipe" system: wood cells are hollow and surrounded by cell walls. Many wood cells placed over each other form a pipe. The cell walls consisting of oblong, very thin and extremely stiff cellulose fibres are also capable to absorbing humidity. Like "steel rods in concrete", they are embedded in the hemicellulose mass which is capable of binding water: The wood swells, increasing its volume. Initially, we had planted a few rows of trees (see sketch) had been planted on the grounds of the Chemical Institute in Berlin-Lichterfelde-Süd in 1960 (two years before we were able to move into the building made available for Biochemistry). Tree material: flexible young planes and willows of approx. 5 m height. 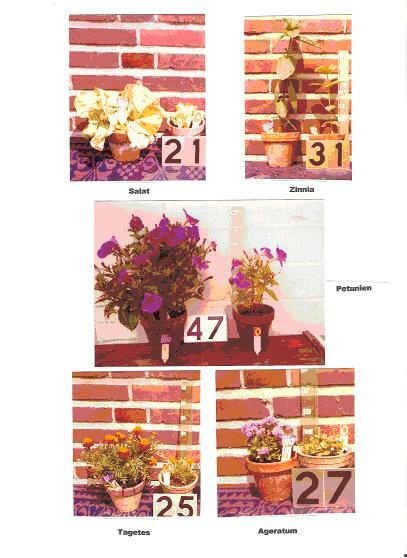 For details regarding the arrangement of the plants, please refer to the sketches. The following studies could be made on the rows of trees in Berlin and later in Brasil: Table 2, in Berlin albeit until they were "given the axe" in the mid seventies: SPECIAL PART; see ref (7a). Since being called to a chair at the Brazilian University of Santa Maria in 1964 and accepting – instead of the call - the assignment to establish a Chemical Central Institute with all branches of chemistry according to a German role model, the author had the opportunity to work for many years, every time some months, on these issues in Brazil - initially in parallel to the first experiments in Berlin - from 1966 onwards (Plate 1, notice in Berlin newspaper). Will two trees planted cross-wise in rows that are connected by metal belts tolerate the foreign material? 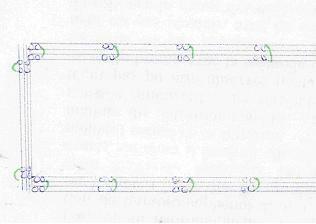 Observation of coalescences: Does pressing together, i.e. collisions, result in coalescences within the meaning of fusing? How stabilising are coalescences? Can they be promoted? Do "solid walls" result in trees planted in a row? How reactive are the trees? Can working foundations be created with living trees? Can tree constructions, i.e. natural constructions of low height, form a working supporting structure? It can be inferred from plate 2 [containing a letter from the chancellor of UFSM regarding quotation (1)] on the next page how and where in Brazil our tree technology work was continued: regarding Topic 2), we started in 1966 on the fazenda of the chancellor (until approx. 1985), then, from 1972 onwards, simultaneously in RORAIMA; regarding Topic 3), in RORAIMA, also starting in 1972. Everything was beautifully organised as promised at the time in the letter (Plate 2): approx. 200 trees of 5 to 7 m height were flown in and a protected forest plantation started. In Brazil, it also became evident soon that the questions asked under a) to i) above may substantially be answered in the affirmative over the course of 10 years and that it was therefore possible to erect construction plantations (i.e. 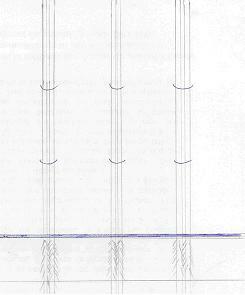 tree constructions) according to certain ground plan (sketches). Re a): Depending on growth in circumference the metal belts were to be changed; belts of other materials were tried, too. Re g): When laying foundations, the light conditions must be observed right from the beginning. Like all plants, trees have a kind of light sensor informing them how they are illuminated. This is a colorant (phytochrome) which is present in an active and an inactive form (a kind of circuit). Re h) and i): According to sketch 3, a rectangular space of approx. 6 sqm open to one side was constructed at a height of approx. 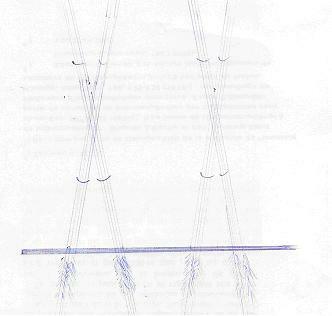 2.5 m which was able to hold the weight of four people (12); see also sketch 5. Re k) and l): We need to gain additional experience. It has already been shown that the tree constructions solidify as the trees grow in thickness; in particular, this also applies for elements combining organic and inorganic materials. Side spaces between the trees can be “closed” by climbing plants if these are directed in the adequate way. - Trees with open aerial roots which cramp on all they can reach can also be used as construction material offering them provisional plastic cores removable when the “clintch” is old enough; these artificially new clintch constructions continue to grow - gaining stability in the course of time when they become thicker. 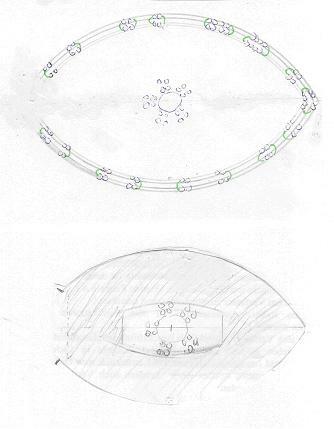 In this field, the author worked with the Brazilian organisations CONSULTING DEVELOPMENT ENGINEERING, S. Paulo and Rio de Janeiro, and BRASTONE, Curitiba, and they applied for registered designs. Owing to contractual commitments, the author is unable to publish photographs of the tree constructions. 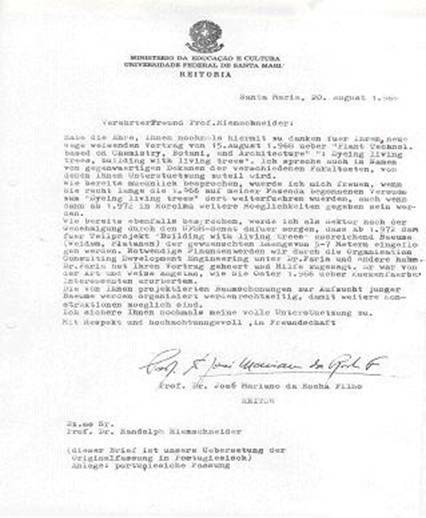 He extends his thanks for the lecture on August 15, 1968 (1) and gives his firm promise to support the projects "Building with living trees" und "Dyeing" in RORAIMA, too, by procuring tree material, planting protected forests and procuring the necessary funds. It is my honour to once again extend my thanks for your lecture of August 15, 1968, on "Plant technology based on Chemistry, Botany and Architecture: Dyeing living trees, building with living trees" which takes us in a fascinating new direction. I speak also in the name of the present deans of the various departments supporting you. As discussed in person already, I would be very pleased if you continued the experiments with "Dyeing living trees" which started on my fazenda in 1966 in the location for as long as possible, even if Roraima will offer additional opportunities from 1972 onwards. As also discussed, I will ensure in my capacity as chancellor that sufficient trees (willows, planes) of the desired height (5 to 7 m) for the partial project "Building with living trees" will be flown in starting from 1972 as soon as the UFSM Senate has given its approval. The necessary funding will be provided by the Organization Consulting Development Engineering headed by Dr. Faria and other sources. Dr. Faria attended your lecture and promised his help - he was much taken with the way you conquered your audience by dyeing chicks at Easter 1966. The protected forest plantations for growing the young trees you requested will be organized well in time to ensure that further constructions can be made. Once again, please be assured of my full support. It goes without saying that we are only thinking of constructing special, "nature-bound" buildings of low height: Architecture in natura. Only practical experiments and the experience gained will show how useful such activities are. The growth in thickness of the trees used may impose limits with regard to time. The cost of maintenance of the constructions will also play a role. The constructions look different depending on the seasons. For Brazil in particular, the project "Building with living trees" was of considerable interest if you know the Brazilian furniture industry which is very close to nature. Furniture typical for Brazil has been made of wood (generally known) and of valuable stones (e.g. Dr. Pesserl's BRASTONE in Curitiba). Addendum from the year 1975: For many years, there was a specialised furniture store at the Berlin Europa Center which sold Brazilian furniture. When the author spent five months in the United States in 1957, he had occasion to visit several national parks in Washington State, California and Arizona; the topic "Building with living trees" might also be of interest to them. During his last visit to the U.S. in the late nineties, however, the author did not hear about such activities. In any case, they are environmentally compatible, they are useful for all places where the environment should be specially protected. Building with living trees is dependent on the climate, i.e. it is primarily of interest for regions with lots of sunshine where living at a certain height is desirable. [For example, pile villages in the country as seen in the Philippines by the author.] Forestry commissions could construct raised hides; the same applies for tree houses suitable for children and constructions in crèches. Also conceivable are be store-rooms which, however, would not be burglar-proof, as well as tree constructions on large estates, farms and industrial plots. Zoological and botanical gardens as well as hobby gardeners will gladly make use of such constructions. Tree house constructions should also be of interest for parks and cemeteries. One can also think on environmentally friendly pavilions, kiosks, bowers, arbours, for instance at rest aereas of motorways. 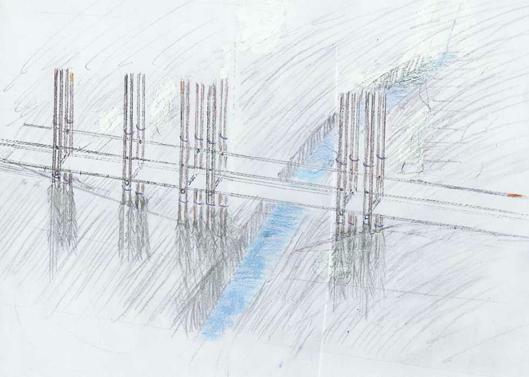 “Bridge-constructions”, footpathes should be possible using living trees providind the constructors are not in a hurry for it will take a few years until the “natural” building can be used: Sketch 5. Only in Brazil was the author able to carry out experiments on living trees for so many years without running into obstacles erected by a forestry commission, planning authority or university administration - just think of the problems caused by the Berlin authorities at a time when the actual experiments had not even started. This place was buried in Red Tape! Unfortunately, this is a problem the author encountered more than once. Just two examples: the futile attempt to register H 2000 as a fodder additive in Bonn in the 1980s (PROJ. XXII) and the prohibition of long-term chlorination in DURAN glass tubes on the roof of the institute building which was no trouble at all in Brazil later. The first practical test of H 2000 and its recognition as a truly useful plant-based fodder additive would not have been possible at the Free University in Berlin after it had undergone "democratisation". Here are a number of tree construction sketches and various pictures of tree plantations created to study the possibilities of using living trees as building material [statics taken into consideration as fas as possible (12)]. If three or four trees are planted densely together and partly connected they turn after years to be one tree. Such tree constructions react differently according to the seasons and at the beginning against later with the specific materials they are exposed to. The sketches 1 to 3 refer to plantations created in Berlin with planes and willows 4 to 6 m high and planted to a depth of approx. 1 m. These experiments were then continued in Brazil with these and other flexible trees. Sketch 3 does not take into account that a rectangular floor was included at a height of approx. 2.5 m. Metal rods support a plastic floor which can be reached over a ladder from the left. 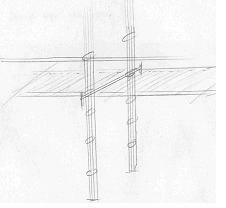 Sketch 4 refers to a tree construction in Brazil with a floor at approx. 2.3 m height which is supported on metal rods mounted horizontally. Access was once again over a ladder from the left. The load bearing member easily carries four people. After two years, it had solidified substantially. A metal railing was placed 1 m above the inserted floor. Supporting wings remaining at their places during the growth of trees, because they grow width, as explained above; coalescences bring stabilizing effects here. Sketch 5 shows how the rods were incorporated. without second doubleline of trees. Footpath, crossing a creek, built with mirroring pairs of trees (6 m high). Tree pairs planted in the earth in a dept of around 1 meter and 50; plastig rectangular floors lying on metal rods between the pairs of trees. Floors covered with suitable material. Metal railing in 1 meter and 20 height over the pathway. Sidewalls may develop over the time by „creepers“. Already after 3 years the connections between metal and tree will be fastened. After this time the first load-bearing capacity experiments on the footpath may be carried out. The so-called yeast cell cytorrhysates (H 2000) prepared by simultaneous physical influences on aqueous yeast suspensions in a certain pH range are characterised by activation of the cell metabolism which, for example, may be detected in WARBURG experiments (Fig. 1) or by the increase in growth of fish and tadpoles (early onset of metamorphosis): Tables 3 and 4, also refer to (9). H 2000 preparations activate the mitochondria, i.e. they increase the yield of ATP which is then available for all ATP-dependent reactions. For example, an increase of the protein synthesis also enhances the growth of those organs responsible for the growth of a young individual: An indirect growth hormone effect which has since been tested in practice on over 500,000 chickens and in comprehensive trials with piglets (in Brazil, Japan, China, Poland, Hungary and the Soviet Union). It is an environmentally compatible fodder additive on yeast basis (9), also in pet food (CANAVIT). In the examples cited here, the above-mentioned new yeast cell preparations have also been used as crude suspension as obtained during production. After deproteination, they have been used as cosmetic additives in Asia for a long time (as CYTOCTALYZER). They are suitable as injection material in veterinary medicine (analogous to Kobe-beef) and as a food supplement and for bodybuilding; because of their pleasant taste, they also find use in solutions for drinking comparable to “Redbull”, for instance. Bei Versuchsdurchführung wurden 60 Jungfische am 15. Tag in die drei Gruppen unterteilt und in einer Wassermenge von 5 l bei einer mittleren Beckentemperatur von 24,5°C zweimal wöchentlich gefüttert. Zwei Fischgruppen erhielten 0,8 bzw. 0,95 promille Zusatz von H 2000, verteilt auf 3 Gaben pro Woche. trees surrounding the shack. But “a nil return”: After three years of “preliminary experiments” on Topic 2) the German forestry superintendent’s office demanded: Do not touch any tree ! Allowed were only experiments within the shack: see Plate 3. When the author was received the call on the chair of biochemistry in 1958 and was nominated in 1962 as Director of the Institute of Biochemistry, Berlin-Lichterfelde-Süd, with a large garden area, he organized planting trees and continued experiments dyeing living trees. Preliminary staining experiments with living trees could be carried out especially to find the best method to inject the dye-solutions without doing the trees any harm. We used dyestaffs mentioned in table 1. One day, in the Mid-70ies, all in 1960 and 62 planted and already experimented with trees were cut down without any warning or discussion according to the order of university admin (7a). The experiments could be continued successfully, starting already 1966 at the UFSM, Universidade Federal de Santa Maria in Santa Maria, Rio Grande do Sul, i.e. at the Fazenda of the REITOR da Universidade and later app 4.000km to the north in RORAIMA, a UFSM proving ground; see Figure 2. To convey an impression of the geographical position of RORAIMA, a map of Brazil is reproduced in Figure 2 that is taken from our reports and was a slide in the lectures of 1990 respectively 1985 (5c, 7c). In quantities chosen at random - and without any conditions - the trees experimented on in Brazil from 1966 onwards were registered and observed for around 25 years. We succeeded in staining the trees completely and evenly, as was shown when they were cut down at the age of 10 to 15 years (5 b). A report about 30 years of experience was written in July 1990 (5c). 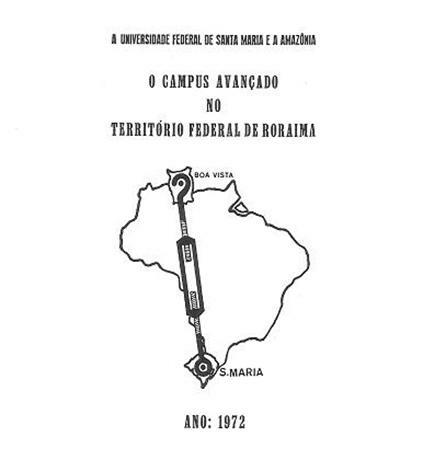 At the beginning of the nineties, the experiments regarding Topics 2) and 3) in Roraima were discontinued since the author was no longer able to travel to Brazil on a regular basis. For a few years, the organisation CONSULTING DEVELOPMENT ENGINEERING which had been involved right from the beginning continued the experiments on suitable land after the succession had been agreed in a contract. 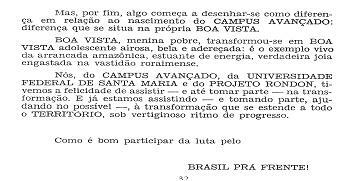 In the opinion of Professors Dinghas (mathematics FU) and Büchi (anthropology FU), it was to be expected that such activities would be denounced by radical students and the "68ers", just as the cooperation with the "capitalist big industry". This research was carried out until about 1968 under the supervision of the author in connection with doctoral theses and with paid employees. For a few years, we were also able to pursue the second objective of injecting solutions (Table 1) for the purpose of protecting plants against fungi, pests and other damages and to improve their resistance in general, albeit incompletely due to lack of time and staff. 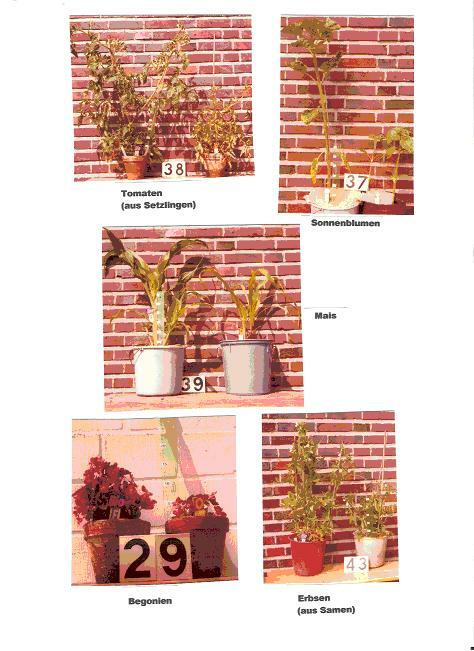 Trees which had been treated with "dye solutions" (Table 1) over 10 to 15 years, were unearthed and planted elsewhere to permit a comparison with untreated trees after further treatment which means: applying solutions containing fungicides, insecticides, preservative agents for long time tests in practice (good laboratory tests like the so-called “Klötzchen-Methode” are well known and used since many years at the Berliner Materialprüfungsamt ). Our further treatments (in strictly separate lots, but in the same soil and not too far apart) were carried out in cases of attacks by fungi and pests (depending on the tree species), drought, cold, etc. So far, only some conclusive results have been produced. It was obvious to treat also "tree constructions" with protective solutions against pests in order to gain additional experience regarding the protection of living trees against pests and fungi. Of special interest was the protection against termites that are capable of decomposing wood. Allegedly, the intestines of these insects contain bacteria able to decompose wood into cellulose and xylane (pentosanes). In order to gain experience for subsequent tree-dyeing experiments, the author had looked into redyeing flowers in the 1940s, experimenting with hydrangeas and roses, planted by ourselves. Of course, the later “Dyeing living trees” was not a question of redyeing, but here a possibility was offered to observe the influence of soil components, pH, light, temperature ecc on and during “colouring natural material”. Here are a few results from experiments with redyeing hydrangeas blue which were pink when delivered (pH of the soil for cultivation 4.0 to 4.5): It was possible to change the colour of the blossoms (delphinidine) from pink into blue by exposure to a sufficient amount of salt containing aluminium (pH 4.5). The less lime binding Al is present in the soil, the more Al can be absorbed. Among other things, ammonia alum was used for dyeing the flowers blue, initially placed directly into the soil and later dispersed homogenously (with the watering can). Redyeing of the blossoms is possible only during exposure to light. The blue of formerly pink hydrangeas became especially intense when the redyeing process was slow (bright sunlight should be avoided and the temperature kept moderate). No hard limey water may be used for watering. The pH value of the water (4.5) was adjusted with sulfuric acid. - The blue colour of the hydrangea blossoms was achieved by redyeing the natural colour; it was not possible to “redye” hydrangeas with white blossoms containing no “dye”. Roses were redyed in many series of tests which will be described elsewhere (i.e. 10). The experience gained with hydrangeas and roses were very helpful for the subsequent Topic 2) tests. After the lecture on August 15, 1968, on the topic "PLANT TECHNOLOGY based on Chemistry, Botany, and Architecture: Dyeing living trees, building with living trees" (1) there were interesting discussions about the topic as such, but also about more general issues related to the raw material wood. Just a few examples: 1) Why does wood crackle in a fireplace? 2) Will burning stained wood be problematic? Question1): In order to answer the first question, we first need to clarify what wood is (already discussed in the essay and lecture, respectively): Wet wood quickly dries in the heat of the fireplace. Its volume becomes smaller; water evaporates more quickly on the surface than inside which causes tension and cracks, thus producing the crackling noise. - Small gas explosions may result from steam partly remaining locked in the wood. The water bound in the cell walls becomes gaseous and creates high pressure which tears wood fibres and causes mini explosions. Probably other gases are involved as well which are generated by the degradation of wood resins by heat. Question 2): Our previous observations are insufficient to give an answer. A functioning chimney with good draw is always a prerequisite for a fire. We are still looking into the toxicology of stained wood. Addendum 2006: There were no negative results up to now. “Dyeing living trees” takes time and wants patience – so we know after more than 20 years of practice; this project comprises many inponderabilities above all if one is bent on a specific and even wood colour. Regarding the topic “building with living trees” the “architect” has to be a determined “hobby-gardener”, as well. 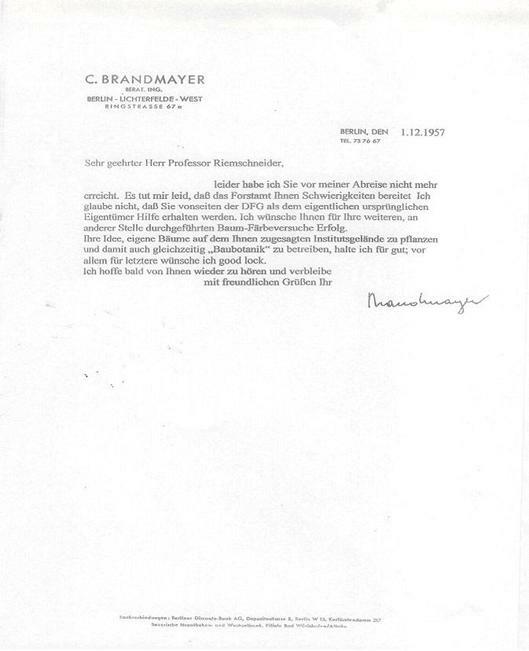 In the letter shown in Plate 2, the chancellor of UFSM thanks the author for the lecture on August 15, 1968. As early as 1966, he provided the opportunity to carry out experiments with tree technology on his fazenda (Topic 2) and organised our further activities there (until 1977) and in RORAIMA from 1972 regarding Topic 2), but also Topic 3). invited: Professor Dr.F.Weygand (Organic Chemistry, TU Berlin). Prof.Herter (Zoology FU) and others. In the years from 1955 to 1972, the author reported the results of his work in Berlin and Brazil (starting in 1966) on the topics "Dyeing the wood of living trees" and "Building with living trees" as well as the initial problems in Berlin caused by the Berlin Forestry Commission and the FU administration after 1969 (7a): see SPECIAL PART "Difficulties and detours to in realising our PLANT TECHNOLOGY project"
Reports from 1955-1958 after preliminary experiments in Berlin-Grunewald on the tree population at Sprengplatz. But after 3 years the German forestry superintendent s office demanded: Do not touch any tree ! Allowed were only experiments within the barrack. All reports secreted (7a); cf. also Plate 3. Unfortunately, the photographs made by Mahmud Azhar, M.Sc. (Punjab), M.Sc. (Islamabad), M. Phil. (Islamabad), ,in Berlin, regarding TOPIC 3) were destroyed by his sister after his death, as were all of his scientific notes. The reason: Azhar's family in Pakistan did not accept and understand that their son died of pulmonary embolism in a German hospital after being admitted because of a torn meniscus (knee). It should be mentioned, that Mr. Azhar worked at the Institute of Biochemistry of FU for many years, last in connection with his doctoral thesis. For details regarding Mr. Azhar's death, please refer to (3). All planted and in experiment being trees were cut down at the instruction of the new “FU administation” without any discussion with the responsible professor. 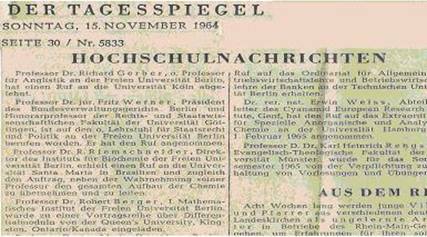 The Free University of Berlin was according to the new University Law (1969) “democratization”, i.e. all Faculties and Institutes had been abolished and the author was degradated to “Comrade Professor Team Leader Riemschneider” (formerly Professor Director of the Institute). Experiments about building with living trees in combination with not-living material according to ground-planes [parallel to (7a) and then continued]. Verfahren zur Herstellung tallophytischer oder bryophytischer Zytorrhysate, danach hergestellte Zytorrhysate und deren Verwendung zur Nährstoffergänzung = Chemizytorryse. der Gruppe: Aspergillus niger, Torula utilis, Saccharomyces-Arten, Lactobacillus bulgarucus ausgewählt ist. Nährstoffergänzung zum Futter u./oder Gießwasser in Mengen von O,1-O,5%. Anspruch 13 illustriert durch Photos aus den Jahren 1962-65.
carried out in the garden of family Suhr, Hamburg in the years 1940 and 1941 (unpublished); see APPENDIX. 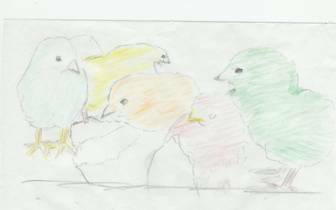 Report 1984, 12 p (secreted); see sketch 5.